Deadpool, now a household name, is a bit of a newcomer to the comic book scene, having only first appeared in 1991. Since his debut, Deadpool has graced the pages of hundreds of issues across the Marvel Universe, including several titles under his own name. This guide collects the series which focus primarily on Deadpool but collectors of the character can also seek out his appearances in issues dedicated to X-Force, X-Men, Spider-Man, and The Avengers, among others. Shop for Deadpool Comic Books on eBay. 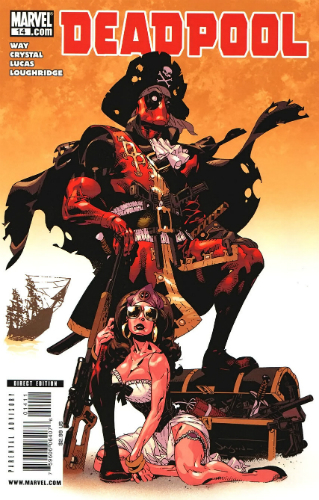 In some aspects, the Agent X comic, which ran for 15 issues from 2002-2003, is considered a Deadpool title as it was created in a similar style at the conclusion of Deadpool, Volume 1. But in terms of continuity, these are not Deadpool books and are not included in this guide. Additionally, there are several single issue and short-run books in the Deadpool collection that will not be featured in this guide but are part of the overall timeline. A total of 100 issues of New Mutants were released between 1983 and 1991. Deadpool made his debut in issue #98, so collecting all the New Mutant issues that are required for a collection is pretty simple. That said, copies of issue #98 typically sell for several hundred dollars and have been known to break $1,000 if highly graded. 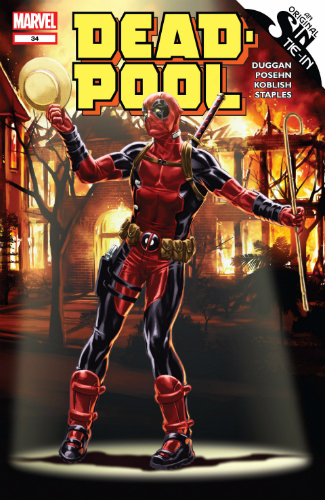 While there are plenty of Deadpool comics to collect, this one is by far going to cost the most money. Volume 1 of the eponymous comic book ran from 1998 through 2002. The book was numbered through #69 but, with the inclusion of #0 and #-1 issues, there were 71 issues released all together. 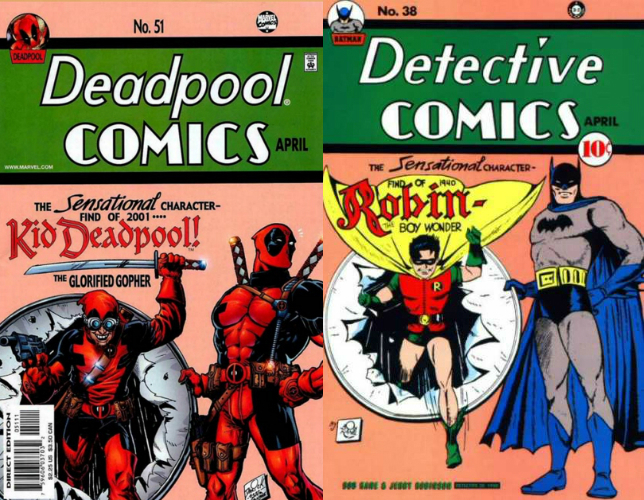 Many of the covers in this series are spoofs of other iconic covers such as #11, which spoofs Amazing Fantasy #15, #51 that spoofs Detective Comics #38, and #62, which spoofs Superman #75. Because Deadpool is a a still new kid on the block in the world of comic books, ungraded copies of issue #1 are frequently found for under $100, which makes collecting these comics an affordable endeavor. This may be one of the most confusing titles in all of comics. Issue #1 of Team-Up was released in December, 1998, and was, ostensibly, never to be heard from again. However, Marvel had other ideas. 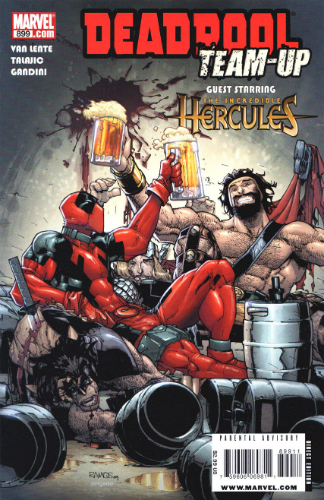 In December, 2009 (11 years later), Deadpool Team-Up #900 was released. If you’re wondering, it would take about seven issues a month in that timeframe to get to #900 but, in Deadpool fashion, the next issue was #899. Yep, this comic is numbered backwards, except for issue #1 (which many consider volume 1), from 900 to 883. That is 18 issues between the two volumes, or however you want to categorize the book. Get all of that? Good. Moving on. In 2002, Deadpool and Cable were both the recipients of pink slips as their titles were canceled. For a short time, Deadpool was replaced by Agent X and Cable was replaced by Soldier X, but both of these books failed to stick. In 2004, Cable & Deadpool was launched to combine the two original characters. 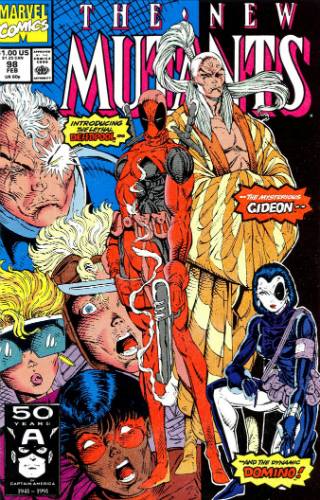 Issue #1 of this series has a cover drawn by Deadpool creator Rob Liefeld and is often referenced when addressing Liefeld’s work. 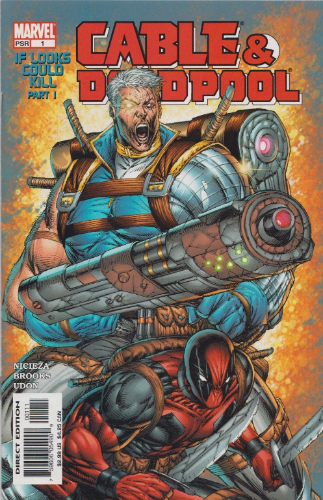 The cover features Cable, who is roughly eight feet tall and 900 pounds, wielding a gun, also probably 900 pounds, with a bent barrel while standing over a crouching Deadpool. It’s an iconic image for all the wrong reasons. The series ran for 50 issues. If you think that a six-year break means that Deadpool was completely absent from comic books, you’d be mistaken. However, 2008 does mark the return of a self-titled series for the anti-hero. Running from 2008 until 2012, Deadpool, volume 2, released 65 issues in 52 months. Although not a bi-monthly comic by standard definition, there are several months during the run where two issues were released. As the series ends on issue #63, collectors must track down issues 33.1 and 49.1 to hit all 65 issues. There are also 23 variant covers, some of which indicate a second printing while others are first print variants, including a first-issue Liefeld cover. 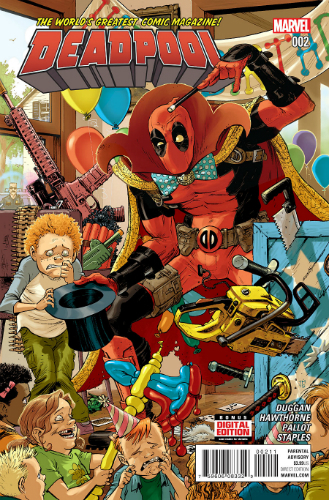 This title, which ran for 13 issues, features alternate versions of Deadpool from other universes in each issue, including Lady Deadpool, Cowboy Deadpool, and KiddyPool. The cool thing about this series from a collecting perspective is the covers. Each of the 13 issues spoof a famous movie poster, book cover or album cover, including Pretty Woman, Jaws, The Graduate, and, Nirvana's Nevermind. Deadpool Corps is a 12-issue series that teams Deadpool up with alternate versions of himself from throughout the universe. 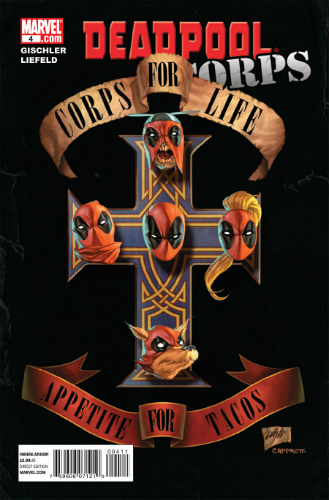 The title is actually a sequel to the series Deadpool: Merc with a Mouth. For a comic collector that is also a fan of classic rock, issue #4 of this series may be of interest as it is a parody of a pretty famous Guns n’ Roses album. The third volume of Deadpool comics came between 2013 and 2015 for a total of 45 main issues, plus two annuals and a biannual. All 45 issues were released over the span of 30 months thanks, again, to several double issue months. All of the issues in this volume were written by comedians Brian Posehn and Gerry Duggan. The most recent volume of Deadpool comics — volume four — began in January, 2016, and, like previous volumes, has been a mix of monthly and bimonthly releases. There are several variant covers, including Hip Hop Variant and Secret Comic Variant. The comic variants can be combined to create a 20-page comic, so a complete set of these variants has the potential to be a sought-after collectible years down the line. Volume four also includes the 25th anniversary issue (#7). In March of 2016, Marvel premiered the first team-up comic between Spider-Man and Deadpool. As a more recent release, this would be a great place for collectors to begin their “complete” collection of comic books. 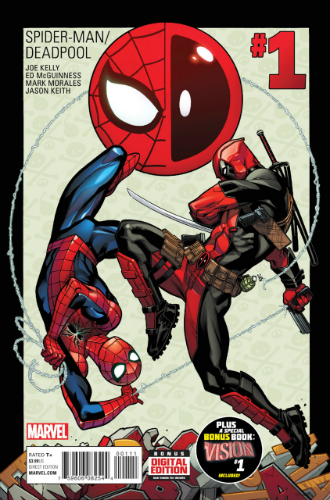 The Spiderman/Deadpool series begins under the authorship of Joe Kelly, a longtime contributor to the Deadpool mythology. Deadpool Max #1! Great Book! MARVEL COMICS, DEADPOOL #1, 1993, CIRCLE CHASE, BEAUTIFUL HIGH GRADE KEY NM 9.4! Tony is a musician and writer in the SF bay area and is a former contributor to The Cardboard Connection.